KATHMANDU, July 28: The Ministry of Finance (MoF) has transferred Rs 3.66 billion from the government coffers so far in the final month of the Fiscal Year 2017/18. A total of Rs 1.66 billion, the highest amount in single transfer, has been allotted for paying to conflict victims and their families. According to the information of budget transfer made public in the MoF website, the Ministry of Home Affairs is to distribute the amount, ensuring no duplication on such distribution. 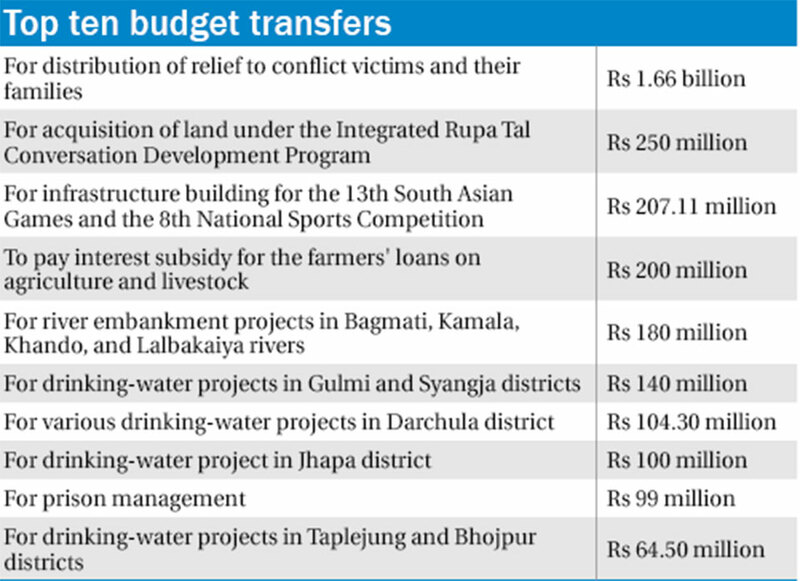 Four out of total ten top transfers are for drinking water projects in Jhapa, Gulmi, Syangja, Taplejung and Bhojpur, and the total amount disbursed in the eleventh hour is Rs 408.8 million. However, the ministry has not given any detail about the projects. And there is no justification given for payment against additional works done on top of the funds allocated through the budget speech tabled in the parliament. Among the top 10 budget transfers, the disbursement of Rs 200 million, which seems justified, for paying interest subsidy on the loans issued for agriculture and livestock sector as allocated amount through the budget was insufficient. But the funds of Rs 180 million allocated for embankment of Bagmati, Kamala, Khando and Lalbakaiya rivers and Rs 207 million for building infrastructure for 13th South Asian Game and 8th National Sports Competition cannot be justified on rational grounds, according to government officials who are not allowed to talk to the media. “There is no point in allocating such budget for the new projects because allocations have been made after tabling of the annual budget in the parliament in May,” the source said. “The budget transfers can be justified only on paying to the projects that have done works beyond targets or additional tasks than the budget allowed to be spent,” said Nepali Congress leader Ram Sharan Mahat, also a former finance minister. Mahat said that any transfer of the budget for the new project in the eleventh hour is only misuse of the taxpayer’s money. “The amount of Rs 1.66 billion for conflict victims is a huge amount and I do not see any point to distribute the money going out of the annual budget,” said Mahat indicating the amount may have been transferred to please the political cadres. The government had emptied all the money from the state coffers at the end of the fiscal year spending haphazardly in the last month of the fiscal year. The government spent near a third of the budget in the last month, from Mid-June to Mid-July.